​What does it mean to be creating new musical theatre here and now? With recent interest in the creation of new Canadian musicals, Mainstage Theatre Company offered a day of masterclasses to work with and learn from Canadian musical theatre artists such as composers, lyricists and bookwriters. On January 13th, we spent the afternoon with composer Colleen Dauncey, lyricist Akiva Romer-Segal, and bookwriter Matt Murray learning how new musicals are developed, using the lens of their current works: Rumspringa Break! We explored the writing process of creating new musicals and how to develop stories for the stage. THANK YOU TO ALL WHO PARTICIPATED IN THIS GREAT DAY! The New Musicals Masterclass is a great opportunity for musical theatre performers to learn more about source material (the scenes and songs), how they come to be and explore approaching them as a performer! Though this Masterclass is open to any youth ages 11-21, we recommend some familiarity with musical theatre performance and encourage everyone to look into the guest artists and the show (keep scrolling for that information below). a story into scenes and songs, how lyrics fit with the music AND THAT'S JUST THE START! Meet the guest artists who will be leading the masterclass! Colleen Dauncey (Music) and Akiva Romer-Segal (Lyrics) are a contemporary musical theatre songwriting team based in Toronto, Canada. They have written the scores to Going Under (Bravo Academy), Scenes From The Bathhouse, Offline (Talk Is Free Theatre), Toronto Fringe hit Bremen Rock City, and contributed material to Touch Me: Songs for a (dis)Connected Age (Theatre Calgary, three Calgary Critics Awards including “Best Production of a Musical"). They also wrote the score to Prom Queen: The Musical, which premiered at the Segal Centre in Montreal, received the 2016 Stage West Pechet Family Musical Awardby the Playwrights Guild Of Canada, and was showcased at the NAMT Festival of New Musicals. Their show Rumspringa Break! (with librettist Matt Murray) was workshopped at Sheridan College's Canadian Musical Theatre Project, and will premiere at the Next Stage Festival in early 2018. Colleen & Akiva’s songs have been performed internationally by cabaret performers, recording artists, and Broadway stars, including being featured twice in New York’s Cutting-Edge Composers series. They were selected as participants in the 2011 Johnny Mercer Songwriters Projectin Chicago, the Cutting-Edge Composer series in New York, the Canadian Musical Theatre Writer Collective, Acting Up Stage’s Noteworthyprogram for songwriters and librettists, and Theatre 20’s Composiuminitiative.They are grateful for the generous support from the Foundation Assisting Canadian Talent On Records (FACTOR), the Ontario Arts Council, and the Canada Council For the Arts. Toronto based Matt Murray has been part of the Canadian musical theatre scene for 20 years. Starting as a performer, he has worked on stages all across the country (as well as the U.S.) in productions like Mamma Mia!, Boys In The Photograph, Hairspray, Little Shop of Horrors, and The Full Monty. His main focus these days is as a playwright and book writer for musicals. Matt co-wrote and directed the hit play Remember, Maggy? which was picked as “Best of Toronto Fringe” and has since gone on to four subsequent productions. His play Myth Of The Ostrich was a hit at both the Toronto Fringe and the Next Stage Theatre Festival and went on to be presented as part of the Royal Manitoba Theatre Centre’s 2016 season. In 2016, Matt was part of the Canadian Musical Theatre Project at Sheridan as book writer for the new musical Rumspringa Break! (collaboration with Colleen Dauncey and Akiva Romer-Segal). Rumspringa Break! will be be presented in January, 2018 as part of the Next Stage Theatre Festival. Matt is also the librettist for Going Under (collaboration with Colleen Dauncey and Akiva Romer-Segal) and co-librettist, co-lyricist, co-composer of My Bonnie Lass (collaboration with recording artist Johnny Reid) which was developed at Sheridan's 2017 CMTP. Most recently, Matt wrote the script for Ross Petty's A Christmas Carol - The Family Musical with a Scrooge Loose at Toronto's Elgin Theatre. Before committing to the Amish faith forever, seventeen-year-old twins Hannah and Ruth leave the comfort of their sheltered community to explore the outside world for the first time. After finding themselves stranded in Buffalo's roughest neighbourhood, all their plans go up in smoke. 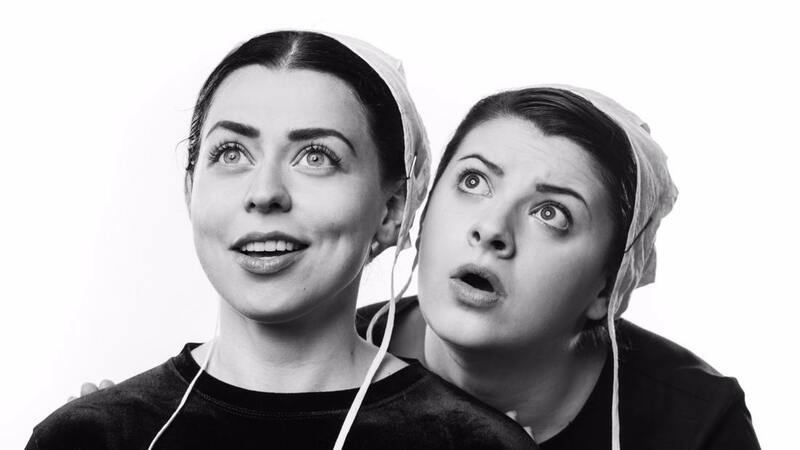 In order to survive, the sisters must rely on their faith, the outlandish locals, and each other, in this hilarious new musical. Find out more about the production and the artists!